What's in the Mayors' Plan for Vancouver? Vancouver will welcome 170,000 more residents and 120,000 new jobs by 2045. The Mayors' Plan tackles unreliable commute times and overcrowding now, then grows with us for the future. 80 per cent more NightBus service and 30 per cent more HandyDART service. 220 new SkyTrain rail cars for 50 per cent more service on the SkyTrain system. 25 per cent more bus service, including West 4th Avenue, Southeast Marine Drive, and Kingsway. 5 new B-Line rapid bus routes. Service every 10 minutes during rush hour and every 15 minutes at all other times. Upgrades to quadruple investment in regional road improvements over the next 10 years. 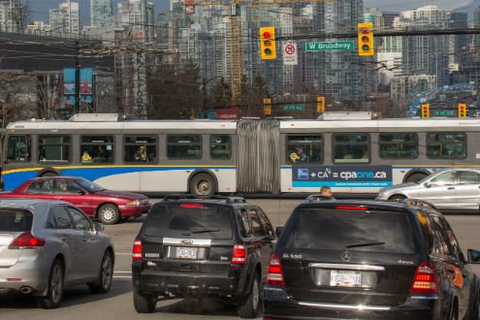 The Mayors’ Council Plan for Metro Vancouver will reduce traffic congestion by 20 per cent, allowing drivers and transit users to save 20 to 30 minutes per day on some of the region’s most congested corridors. For drivers, that means less time stuck in traffic and, through improved transit service, a real alternative to driving. For transit users, it means better and extended bus service, improved HandyDART service, and an expanded rapid transit system for the region. For pedestrians and cyclists, the plan will mean safer commutes and better connections to all modes of transport. What are the transportation and transit investments from the Mayors' Council Plan that will benefit Vancouver residents and businesses? The City of Vancouver opposes cut-and-cover construction along Broadway, based on a Council motion passed in January 2008. Bus service will be more reliable, frequent, and extended. December 11, 2014 – The Mayors' Council on Regional Transportation released its recommended referendum question and a regional funding proposal on their Transportation and Transit Plan. June 12, 2014 – The Mayors' Council on Regional Transportation released the plan "Regional Transportation Investments - A Vision for Metro Vancouver". The plan includes rapid transit along the Broadway Corridor between Commercial Drive and UBC, with the first phase being a tunneled extension of the Millennium Line to Arbutus Street.